You are here: Home / Diversity / TechInclusion Seattle and Open Source Bridge: a diversity-in-tech twofer! Two of my favorite conferences, in back-to-back weeks, make the Pacific Northwest the place to be for diversity and inclusion in technology this month. everything I look for in a conference experience: excellent content, outstanding networking, and a great mix of attendees — entrepreneurs, diversity and inclusion experts, policy people, executives, designers, engineers, marketers, investors, and hard-to-categorize people. The vibe was wonderful as well, positive with a sense of excitement, with the aid of remarkably good food and coffee. Wayne Sutton, Melinda Briana Eppler, and the team at Change Catalysts do a great job organizing conferences, so unsurprisingly the agenda for the Seattle event features a similarly exciting mix of people: Saara Romu of the Gates Foundation, Jessica Eggert of Include Seattle, Tammarrian Rogers and Aurea Astro of Microsoft, Leslie Miley of Venture for America, Ellie Tumbuan of The Justice Collective, Andrew Mcgee of Greater, Surya Venka of and many others. As if that’s not enough, this time the list of hard-to-categorize people includes … me! I’ll be speaking about Diversity-friendly software and strategy on Wednesday, June 14, at 3 PM. * Just to drive home the point about how good the networking is at TechInclusion: one of the examples of diversity-friendly software I’ll be talking about is O.school, where I’m currently Tech DIVA (Technical Diversity, Inclusion, and Values Advisor). And how did I connect with O.school? By striking up a conversation with their CEO Andrea Barrica after a panel she was on at TechInclusion SF! 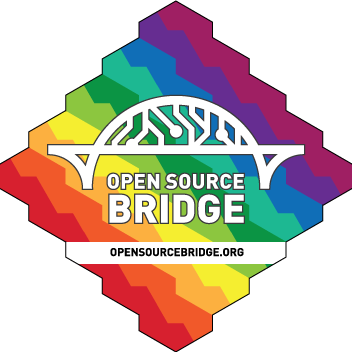 Open Source Bridge (“the conference for Open Source Citizens”) is a 100% volunteer-run conference that’s been going strong since 2009 with a very strong diversity focus…. It’s more focused on development and design than some of the other conferences, with a lot of discussion of community organizing and the business of open source as well. As always this year’s schedule looks amazing, starting with the keynotes: Nicole Sanchez on Tech Reform, Walé Ogundipé on Doing away with (bad) shibboleths (it’ll be really interesting to see how everybody pronounces the talk’s title), and Emily Gorcenski on Fake Science! Sad! A case study of the perils of Open Data. As a Mastodon fan, I’m also really looking forward to Federating with Trouble by the toot.cat admins; and the programming tools geek in me is very excited about my former MSR colleague Michael Ernst’s Create your own type system in 45 minutes. It’s going to be a great conference, so if you’re in or near the software industry it’s worth checking out whether or not you’re into open source. This year Open Source Bridge has added a track on activism – including my Thursday morning session Grassroots Activism is Hard. Can Open Source Help? A lot of diversity-in-tech and citizenship-in-open-source people live multiple lives, so if you’re also a grassroots activist, I’m very interested in hearing about the tools you’re using, what works, and what doesn’t. Here’s a blog post with more information and a link to a survey. And if you know somebody who’s involved in grassroots activism, especially with an intersectional focus, please pass the link along! So those of you who are at tech companies in the Pacific Northwest, or within flying distance of Portland: as you’ll hear at my Tech Inclusion talk on Wednesday, investing in diversity-friendly software offers some significant technical advantages. Sponsoring an event like Open Source Bridge is a great way to start connecting with the community, and giving one or more engineers or designers at your company a great chance to learn skills and make connections. Please check out their sponsorship prospectus, and see if it makes sense for your company to sponsor!